A new edition of a foundational work of cognitive science that outlines a theory of the development of specifically human higher mental functions. Since it was introduced to the English-speaking world in 1962, Lev Vygotsky's Thought and Language has become recognized as a classic foundational work of cognitive science. Its 1962 English translation must certainly be considered one of the most important and influential books ever published by the MIT Press. 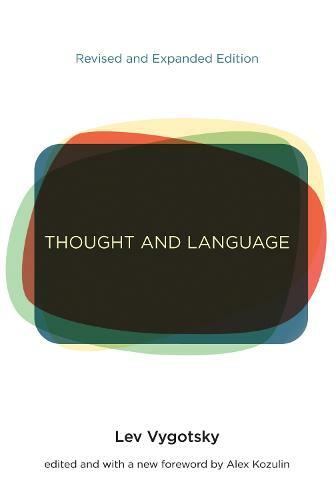 In this highly original exploration of human mental development, Vygotsky analyzes the relationship between words and consciousness, arguing that speech is social in its origins and that only as children develop does it become internalized verbal thought. In 1986, the MIT Press published a new edition of the original translation by Eugenia Hanfmann and Gertrude Vakar, edited by Vygotsky scholar Alex Kozulin, that restored the work's complete text and added materials to help readers better understand Vygotsky's thought. Kozulin also contributed an introductory essay that offered new insight into Vygotsky's life, intellectual milieu, and research methods. This expanded edition offers Vygotsky's text, Kozulin's essay, a subject index, and a new foreword by Kozulin that maps the ever-growing influence of Vygotsky's ideas.